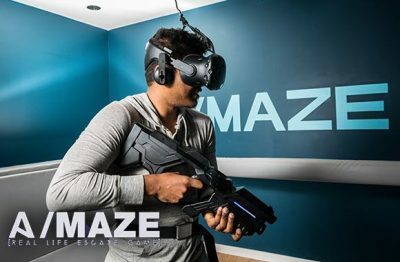 A/Maze presents a unique virtual reality arcade with Kinescape technology. The platform allows to roam around an infinite virtual space with the same freedom one may experience in everyday life. With the best VR headset available on the market, the Kinescape is the only VR locomotion solution that allows the user a full range of motion. Try this truly unique activity in Montreal West Island. Play the coolest Aperium VR game: Dead End! Enter a post-apocalyptic universe and try to survive the zombies with a simple crossbow as your weapon. Will you make it?